Ahmadiyya Muslims view this prophecy of the battle of Armageddon as a spiritual battle or struggle in the present age between the forces of good, i.e. righteousness, purity and virtue, and the forces of evil. 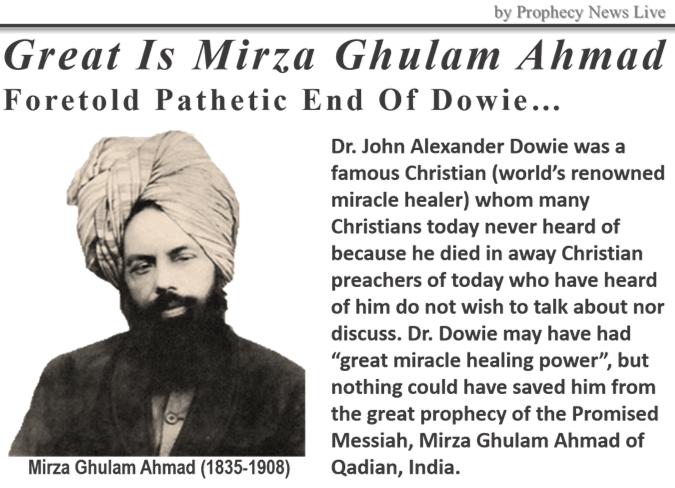 Regarding this prophecy, history proved its fulfillment from the victory of the battle of prayer fought between the Founder of the Ahmadiyya Muslim Community (Promised Messiah, Mirza Ghulam Ahmad of Qadian, India) and Dr. John Alexander Dowie of America, who was a bitter enemy of Islam and the Holy Prophet Muhammad (peace and blessing of God be upon him). Through speeches and writings in his international publication Leaves of Healing, Dr. Dowie made repeated expressions of his hostility towards Islam. In News of Healing, August 15, 1903, he delivered himself with the most despicably written attacks reviling his eagerness to destroy Islam and the Muslims. Now, among the many signs supporting the reappearance of Jesus is the fulfillment of the prophecy of false prophets. In fulfillment of this prophecy, the world had never witnessed false prophets before, like it did in the last decades of the 19th and early 20th century. During which time there appeared several men and women from around the world claiming to be prophet and forerunners of Jesus (peace be upon him). Among the many, there was not another like Dr. John Alexander Dowie of Zion, Ohio, a prominent American Christian evangelist spiritual healer who enjoyed good health and wealth. Dr. Dowie was an uncrowned King in his founded city named Zion. In 1901 he claimed to be Prophet Elijah the Third who came to prepare the way for the expected descent of Christ.